Samantha Angell: Travel & Lifestyle Blog: Wednesday Wine: Norway! Welcome to another week of Wednesday Wine! I've been busy for the last week or so, traveling in Germany, Sweden, and now Norway with my family. Because I wrote about German wines last week while in Germany, today I will talk about Norwegian wines! Of course, that will also make for a fairly quick post. When most people think of Norway, they think of cold, snow, the Vikings, and perhaps the fjords. However, you'd be surprised to learn that even with the cool climate, Norway can still grow and produce wine! Of course, just because it is produced doesn't attest to the quality of it- yet, nonetheless, wine is produced. For those back in the US, an interesting fact may be that wine is grown and produced in all 50 states. Now, when you think about producing wine and growing grapes, you may think of the sunlight and warm weather needed to ripen grapes. In this, you are absolutely correct- sun and heat is what helps grapes to grow and produce the flavors that they do. Because of this, when you are thinking about regions of the world, their climates, and how the wines that are produced there will taste- keep the climate in mind and how ripe the grapes are likely to get. For example, in cooler climates that have a shorter growing season, such as Norway, it may be more difficult to produce ripened grapes- whereas warmer, desert-like climates may end up producing overripe grapes, or darker flavored fruits. When purchasing or trying new wines, a great tip is to look at where the grapes are grown and think about the climate- cooler climates will produce lighter, sweeter flavors, whereas hotter climates will produce darker, more earthy flavors. White grapes will often perform better than red grapes in these cooler climates, and vice versa with warm climates. There you have it with Norwegian wine! It exists, and even I am unsure of the flavors and taste of it- after being here for the past 2.5 days, I have yet to see or be able to sample Norwegian wine! However, I hope that today we were able to give a good lesson in how climates affect wine growing. 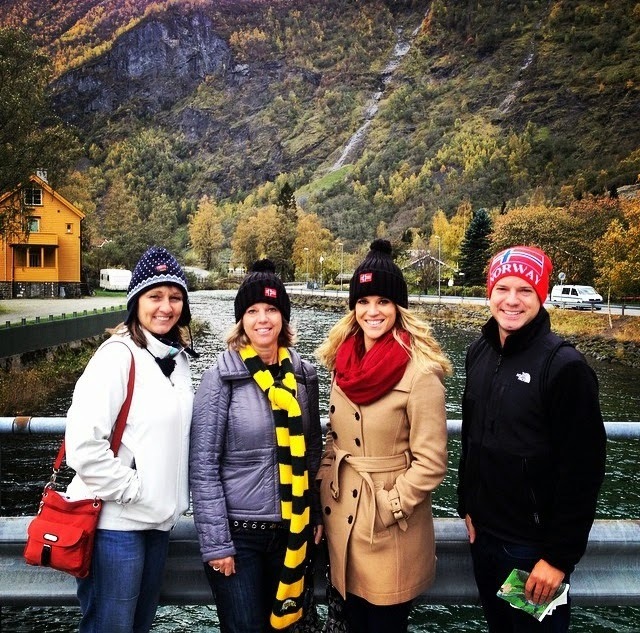 To leave off, I will share a picture of my family and I enjoying the Norwegian fjords! The whole family exploring the Norwegian fjords!